On Friday, October 12, Mud City Old-Time Society hosts their fall Hoedown Showdown at the WOW Hall. 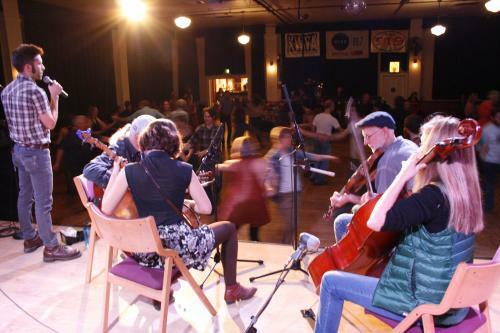 The Hoedown Showdown is a celebration of traditional American square dancing, and features three bands and three callers from the Willamette Valley. You don't need to bring a partner because there are lots of friendly people to dance with, and you don't need to know anything about square dancing because the caller explains each dance before you dance to live music. The event is sponsored by Eugene's own Mud City Old-TIme Society, dedicated to supporting traditional old-time music and dance in the Southern Willamette. As a non-profit, they are run entirely by volunteers to promote and sponsor concerts, workshops, jams and square dances in the community. For more information go to mudcityoldtime.org <http://mudcityoldtime.org> and @mudcityoldtime on Facebook. Doors open at 8:00, dance ends at 11:00. Cost is $8, with a $5 starving artist rate.